Jog slider changes after turtle click. I've been running gmoccapy on machinekit/wheezy for a couple years and it's been great. My machine's native unit is in but I use mm in the UI. When I first launch, the slider is sitting at 381 as expected and the slider will got to 2987. When I toggle to turtle and back, it's all the way at the positive extreme which is now 118. For now, I've hidden the turtle feature but would like to use it. A second problem I'm experiencing is an error thrown whenever a message is displayed. Replied by cmorley on topic Jog slider changes after turtle click. Being that this in machinekit - do you have any idea what version this would be compared to linuxcnc? I'm not sure machinekit pulls in from linuxcnc anymore. I think Norbert has version numbers for Gmoccapy is there a way to find that out from the screen? Norbert (Gmoccapy's author) isn't as active as he once was. But we will try to help. PS Thanks for your work on freecad path! Replied by newbynobi on topic Jog slider changes after turtle click. I can do not support machinekit any more. Unfortunately it does not support joint axis support. Or it is handling that different than linuxcnc. I stoped the development for machinekit with the introduction of joint axis in linuxcnc. As i do support linuxcnc master and 2.7 beeing different releases of gmoccapy i unfortunately can not efort any more time for a third version of gmoccapy. The mentioned errors have been solved in linuxcnc. If you mention the release number of gmoccapy you use, i can take a look what I changed. Just open the settings page an look for the release details in the bottom button area. Replied by sliptonic on topic Jog slider changes after turtle click. 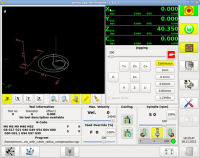 I am able to reproduce the slider error also in the linuxcnc release, i will look at it and correct that error! I just pushed a fix for gmoccapy 1.5.X for the turtle button and an error I found in max vel slider handling. that is not to hard.